I have been on my share of diets. Weight Watchers, Atkins, South Beach and several others. I have weighed, measured, and estimated portion size for much of my adult life. Those days are behind me now. Now, my rules are fairly simple. I load up on as many fruits and veggies as I want and try to eat mostly what's in season. I do not believe in counting portions when it comes to fruits and vegetables. Today I had two apples, an orange, a banana and a cup of grapes. And that was just the fruit. I had about 3 cups of salad and a whole bunch of bell peppers. I just do not believe in counting portions when it comes to fruits and vegetables. My rules around everything other than fruits and vegetables are also pretty simple. I just eat VERY little of it. Breakfast is a half cup of cereal. An eighth of a chicken plus a half a potato is dinner (plus several portions of salad or veggies). If I want more, or if it isn't meal time, I reach for a fruit. I do my very best to eat nothing but fruit between meals.Overall, after all is said and done, I probably take in about 1000 calories a day. But I don't count or measure! I've been diet-free for almost a year now and I FEEL GREAT. Great about myself and how I look (yes! I lost 25 pounds since I stopped dieting!) but also great about how I can finally enjoy food without the guilt. The recipe below is a great main dish salad. It's got quite a bit of bulk from vegetables, and the lentils and salty goat cheese are a near perfect protein. In my humble opinion. I had this with a whole wheat roll for dinner tonight and it was just wonderful. It looked and tasted gourmet. But I promise it was easy! Use vegetable stock if you can, here. It adds a lot of nutrients and flavor. Although I haven't tried it, this recipe would probably work well with ordinary lentils too. I like the French lentils because they are small and delicate, and they cook up quickly. You'd probably need to increase the cooking time with regular lentils. (Let me know if you do try it so I can update the recipe!) You can also serve this on a bed of greens or baby spinach if desired. While the lentils are cooling, saute the onion in 2 tablespoons of olive oil for about five minutes. Add the garlic, carrot, and celery, and saute, stirring occasionally, for about 5 minutes longer, till the vegetables are softening and the garlic is fragrant. In a large bowl, combine the cooled lentils with the sauteed vegetables. Add the pepper and parsley. Stir in the remaining 3 tablespoons olive oil, plus the vinegar, salt, and pepper. Linking this up to Weekend Bloggy Reading! This looks soooo good! I can't wait to try this. I've been on a lentil kick lately, and I was looking for different ways to use them. I agree wholeheartedly! I too eat all of the fruits and vegetables that I want without guilt. I only really exercise portion control when I am indulging in food that I really shouldn't have :) Great recipe! Hey there! Saw your comment on my friend Joanna's blog and had to stop by. I need to use more lentils in my cooking and it seems like you have it down pat! This salad looks insanely delicious. I might have to force fed it to my husband who doesnt't like lentils for some reason but then again I am cooking for me not him- right? okay, maybe not but I am determined to get him to like them! I have been drooling over this since you tweeted it last night. It sounds divine. It's so colorful and pretty! Makes my mouth water! Plus I love anything (read: anything!) with goat cheese! Congratulations on your non diet weight loss. I think it's great. The lentil salad looks delicious. Will be trying this for lunch next week. Love the French lentils and the vegetable stock! This is an awesome dish and looks like it would work well for several meals during the week! It's going on the list! I've never seen lentils looking so delicious! 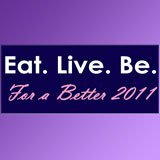 Thanks for sharing with us your eating philosophy! I've been on every diet imaginable and vowed not to do it anymore. Still trying to shake off some of that diet mentality. This looks awesome---it's totally everything I love! Diets make no sense to me & I am with you on not cutting back on veggies & fruit. I cut out all processed food from my diet (everything white) for one year and I felt great in addition to losing 8-9 kgs in two months. I keep meaning to go back to that (processed foods have creeped back in) & lack the discipline lately. That said, I love the look and sound of this salad and can't wait to make it !